Nottingham Trent University (NTU) has signed a Memorandum of Understanding (MOU) with the Indian Institute of Technology, Bombay (IITB), the highest ranked institution in South Asia. Professor Edward Peck, Vice-Chancellor, NTU and Professor Devang Khakhar, Director IITB, were extremely pleased to formalise a collaboration. 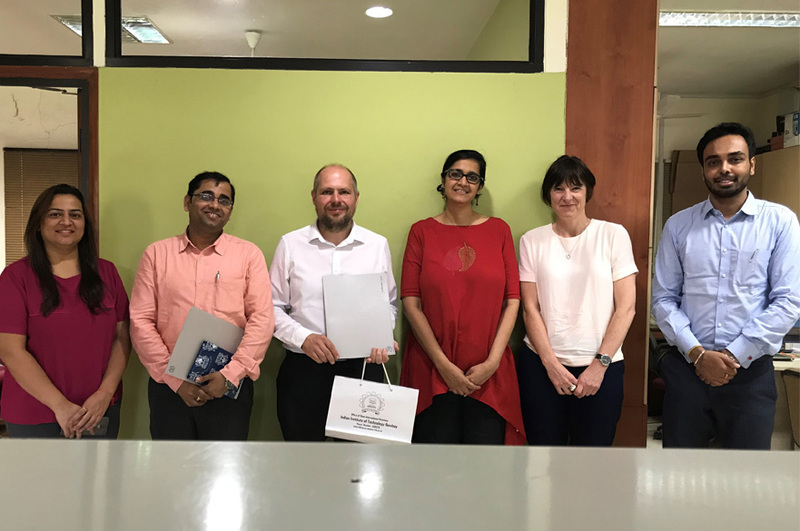 On the back of Professor Graham Ball’s collaboration with Professor Sanjeeva Srivastava, IITB, a general MoU was signed in June 2018, to support the collaboration and facilitate the co-supervision of PhD students and virtual mobility. It is testament to the quality of our research and NTU’s growing international reputation that IITB has requested to sign an MoU with NTU. Professor Ball is Professor of Bioinformatics in the School of Science and Technology, Molecular Biology Lead for the John van Geest Cancer Research Centre and supervises undergraduate, postgraduate and doctoral research projects at NTU. He also teaches on Bioinformatics, Statistics and Environmental Science modules. Professor Sanjeeva Srivastava is the Associate Professor at IIT Bombay, teaching Proteomics, Biotechnology, and Cellular and Molecular Biology.